PayDC chiropractic electronic health records (EHR) software was created and developed by chiropractors, billing and coding professionals, and insurance auditors. This cloud-based solution includes four easy-to-use modules, including documentation and scheduling, billing, cash/insurance payment planner, and EHR stimulus support/meaningful use. 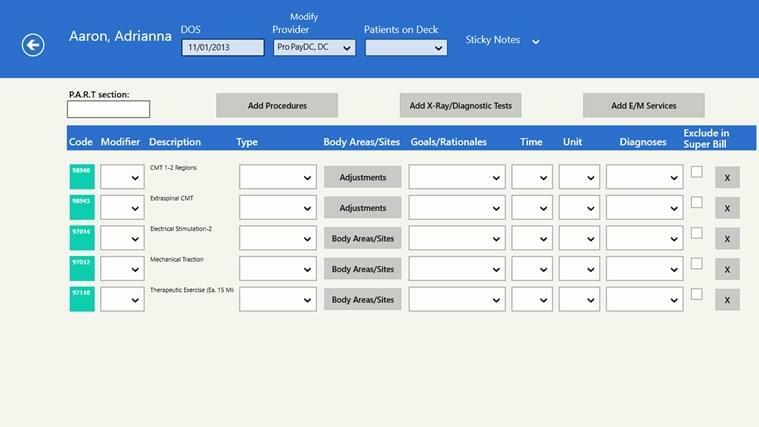 PayDC’s documentation and scheduling module includes automated SOAP notes to help chiropractors document patient visits and quickly create customized care plans. The PayDC patient portal gives patients access to medical information, and lets patients enter their own medical history and contact information. Additionally, the scheduling system automatically sends patients an email to confirm appoints, including one-click patient check-in and an online waiting room. The billing module can automatically generate claim information based on your completed daily notes. Any claims are scrubbed by the system to verify accuracy and complete information. The PayDC system also generates financial and practice productivity reports to help you increase practice efficiency and reduce administrative time. The cash/insurance payment planner module lets you estimate insurance payments and patient personal payments, in addition to helping you create payment plans tailored to your individual patient’s needs. The care summary generator assists you in demonstrating to patients how much care they will needs, any costs, what insurance will pay, and what the payment plan is. The stimulus support and meaningful use module works with you to meet meaningful use requirements, benchmarking progress and eligibility status. McGunnigle Chiropractic was initially overwhelmed by everything PayDC offered in their system. With the training provided by PayDC, the McGunnigle team was able to quickly learn the system, and is now experiencing an average $15 revenue increase per patient visit. Learn everything you need to know about PayDC. Our experts will reach out to you shortly.